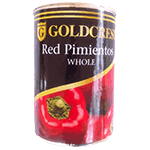 Pimentos are a type of small, round, red pepper with a sweet flavor and very mild heat. Pimentos are also known as cherry peppers, because of their red color and round shape. A common use for pimentos is to dice them and stuff them into Spanish or Manzanilla olives. These pimento-stuffed olives are traditionally used for garnishing martinis. They're are also used in making pimento cheese and pimento loaf.